Be the first to share your favorite memory, photo or story of Arlan. This memorial page is dedicated for family, friends and future generations to celebrate the life of their loved one. 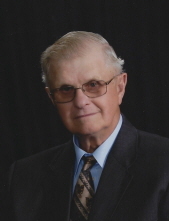 Arlan Eller, age 85, of Hubbard, IA, passed away on Friday, February 1, 2019 at his farm-place. Arlan Walter Eller was the son of Walter and Beulah (Peckenpaugh) Eller born May 11, 1933 in Eldora Iowa. He graduated from Radcliffe Community School in 1951. He went on to attend Westmar College in LeMars Iowa where he met his wife ,Darlys Fawley. They were united in marriage on August 14, 1952. Arlan grew up on the farm along with his 3 brothers. He was a big help to his parents being the oldest of the four boys. His love for the farm continued as after a year of college, he got a job working for his Uncle and eventually went on to buy his own farm outside of Hubbard where he and his wife Darlys reside. He never really retired from farming as he was still helping his son, Phil, with whatever he could at the age of 85. Arlan was active in the Iowa Cattleman’s Association. He served on the Farm Service Board and the Federal Land Bank Board in Nevada. He was a charter member of Faith Evangelical Church in Radcliffe where he served on the board, taught Sunday School and AWANA for many years. His love was serving others, as he was active in Men For Missions International, and went on several mission trips. He and his wife Darlys would often have missionaries stay in their home as well. Arlan loved to travel too. He always had a family vacation planned every summer and spent a couple weeks in the winter for a few years, with their daughter Jolene, when she lived in Florida. He always wanted to get back home to his Grandchildren who he loved as well. He especially was excited when his Great Granddaughter Layla was born in 2017. Arlan accepted the Lord as his personal Savior at a young age and throughout his life would share that with others. He had a love of reading and read through his Bible several times. He couldn’t contain his excitement as he watched Biblical prophecy unfold through current events. He unexpectedly passed away on February 1, 2018 at his farm. We know that he is excited to be with his Heavenly Father who he so loves. Those remaining to celebrate his life are his Beloved wife, Darlys of Hubbard Iowa; Two children Philip and his wife Carla of Hubbard Iowa and Jolene Erickson and her husband Eric of Jewell, Iowa;5 Grandchildren Taylinn Eller, Taylor Eller, Tayber Eller, Garrett Chaplin and Kolton Chaplin;1 Great Granddaughter Layla Eller, his 3 brothers Merlin and Pat of Radcliffe Iowa, Gaylen and Barbara of Urbandale, Iowa and Reynold and Jeanne of Urbandale Iowa plus 11 nieces and nephews. Arlan was preceded in death by his parents and twin brothers, one who was still born and Daylis who passed away in infancy. To send flowers or a remembrance gift to the family of Arlan W. Eller, please visit our Tribute Store. "Email Address" would like to share the life celebration of Arlan W. Eller. Click on the "link" to go to share a favorite memory or leave a condolence message for the family.